Goole-based O&H Vehicle Conversions (www.ohvc.co.uk), a manufacturer of emergency vehicles, has appointed an experienced industry name as its new managing director to drive major company growth. 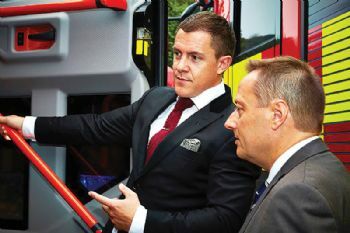 Oliver North, founder and former managing director of firefighting-vehicle specialist Rosenbauer UK, has immediately set his sights on driving home-grown innovation and production. Having announced recently that he was taking a step back from Rosenbauer UK to concentrate on other opportunities, he has been drafted in by private-equity firm Endless LLP, which acquired O&H in 2016 to attract key customers in the UK and in export markets. Endless’ investment director Matthew Jubb said: “We are delighted to have appointed Oliver as the new managing director of O&H. Mr North said: “O&H has been a pillar of British emergency services vehicle manufacturing for over 30 years. Nevertheless, I still see the company as the sleeping giant of the industry.